I noticed a feature on Geoff Young's blog about the first game he ever attended, and though I have alluded to my analogous experience in this space before, I had never really taken the time and effort to research it in detail. The truth is I don't know exactly when my First Game Ever (FGE) actually was, and I remembered so few details from the experience that I assumed I could never know the exact date. I can't know the exact date. But surprisingly, I managed to cobble together enough details that I think I have at least narrowed it down to a couple of possibilities. I'm pretty sure the game was fairly forgettable, not least because I have essentially forgotten it. If someone from my team had thrown a shutout or hit two homers, as Gene Tenace memorably did for Geoff Young's FGE, I would probably remember. It was at Yankee Stadium, some time in the mid 1980's. I went with the Lodi Boys Club, in a 15-passenger van, and we sat in the bleachers. Ron Guidry was on the team, but did not pitch. *Younger than me. Not in the bleachers at Yankee Stadium. I think I remember Barfield because he was a pretty decent player at the time and because his name had "Barf" in it. Ten or 11 year old boys remember stuff like that, you know? But that recollection isn't as helpful as you would think because Barfield's career (1981-92) spanned most of the part of my childhood I can remember, and he even spent the last four years of his career with the Yankees, so really, who knows? But I'm pretty certain it wasn't in the '89-'92 seasons, as I was already a teenager by then, and I would remember the experience better. Also, I don't think I was going to the Boys Club anymore by the time I was 14, except when they had dances in the big Bingo room upstairs, where I would go to hang out with my friends and throw those snappy-wrapped-in-paper things at the floor near the pretty girls I was too afraid to ask to dance. I was such a loser. 2) My mom had never seen Yankee Stadium in person, and therefore did not know that I would have needed arms about 10 feet long to shake Guidry's hand from the bleachers. Fortunately she had never visited the Stadium (this would not change until the late 1990's) and was kind enough not to confront me on my lie when she did. However, as it happens, my arms are 10 feet long. It turns out, thanks to the inimitable Baseball-reference.com, that the Blue Jays won exactly 20 games at Yankee Stadium between 1983 and 1988 in which Barfield played, and we can start throwing some of them out right away. The 1983 game is a Friday night in April. Even a loser like me could not manage to get a sunburn on a Friday night in April. We need to look at games during the summer, that started in the afternoon, presumably on a weekend or else a dozen or more school age kids from the Lodi Boys Club would not have been able to go. The ten total games in 1985 and 1987 were all during the school year and/or not during sunburn weather (weeknight games in June, and weekend games in mid September) so it could not have been any of them. The five games in 1988 were all night games, so they're out. That leaves us only four games in 1986. The October 1st game was a Wednesday night, and Guidry pitched a complete game. Therefore there could have been no school kids, sunburn, or plausibly fabricated Louisiana Lightnin' handshake story. That leaves a three-game sweep at the end of June, 1986. I've always remembered this game as being in July but the end of June is close enough. Again, the Friday night game is out because Guidry pitched (badly) and it was a night game. That leaves Saturday and Sunday. The Sunday game was a close contest, with the teams tied 2-2 from the second inning until the Yanks went ahead by a run in the bottom of the 4th, only to allow the Jays to tie it again in the top of the 5th. It stayed 3-3 until the top of the 9th, when rookie manager Lou Piniella (damn, that was a long time ago) brought in Brian Fisher to maintain the tie in the 9th. He promptly allowed Willie Upshaw to up and hit a single and then Fisher couldn't fish a Damaso Garcia sacrifice bunt out of his glove, so everyone was safe. At this point, Piniella presumably should have brought in Dave Righetti, who would have his best season as a reliever in 1986, though at the time his ERA was a shade over 4.00 and he had blown 8 of 24 Save Opportunities. Still, he had been great as a relief ace the previous two seasons, had five Wins and 16 Saves already that year, and was a lefty, like the next batter, Ernie Whitt, who had already homered that day. Instead Sweet Lou inexplicably brought in Al Holland, who had pitched three innings the day before. Somehow Holland got pinch hitter Buck Martinez to fly out to left, but he then allowed a single to pinch hitter Cliff Johnson, a double to Tony Fernandez and a sac fly to Garth Iorg, which you're gonna realize put the Yankees in a 6-3 hole. Holland finally got Lloyd Moseby to fly out to shortstop and end the inning. The Yankees couldn't do much against Tom Henke in the 9th and that's the way the game ended, 6-3 Blue Jays, the Yankees' fourth consecutive loss. Holland had about another month of solid relief work in him before ineffectiveness would get him released in early August, and his MLB career would be over the following April. But that is not the game I attended. For one thing, it was far too interesting, or at least it seems interesting now. No, I'm now pretty sure that the game I went to was the afternoon before, Saturday, 28 June 1986. Jimmy Key started for the Jays against Joe Niekro, who had turned 41 in April of that year and really was not any good anymore. He averaged only about five innings per start and walked more batters than he struck out in 1986. Who says knuckleballers can pitch forever? No longer knuckling Niekro allowed four runs in the first two innings and the Yankees never had a lead. Alfonso Pulido relieved Niekro in the second and they were down 6-1 by the fifth, after Pulido allowed Moseby's second homer of the game and then an RBI single by (*chuckle*) Barfield. Thereafter Pulido was pulled for Holland. The forgettable Gary Roenicke, playing his only season for the Yankees, hit a homer in the 6th off of Jimmy Key, which brought the team's Win Probability up to 23%, as high as it got all day after the second inning. He also singled in a run in the 8th, but the rest of the team went 5 for 29 (.172) against Key and drove in only one run. Also by the 6th inning, my hero Don Mattingly, who was in the midst of the best season of his career, even better than the MVP campaign the year before, was no longer in the game. He had been replaced by Dan Pasqua, who used the opportunity to strike out twice, missing his chance to Wally Pipp the immortal Donnie Baseball. 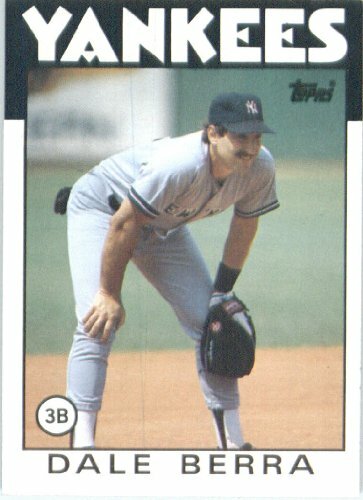 Someone on the Yankees (either Donnie or Rickey) would eventually lead the 1986 American League in Runs Scored, Hits, Plate Appearances, Doubles, Slugging percentage, OPS, OPS+ or Total Bases, and the team would send four players (Righetti, Mattingly, Winfield and Henderson) to the All-Star game two weeks later, but in this game, all were either absent or ineffective. Worse yet, the bottom of the order (DH Mike Easler, C Butch Wynegar, 3B Mike Pagliarulo and SS Dale Berra, went 0-for-14 with a sac fly RBI and one walk. Neikro threw a wild pitch with the bases loaded and then walked in another run before being yanked for Pulido. Holland and Wynegar each made errors, and it was just a sloppy game in almost every respect. Al Holland, as I mentioned, pitched three (mostly effective) innings to close out the game, which eventually and mercifully ended when Dale Berra grounded out to third and and the colorfully-named-if-not-wonderfully-talented Rance Mulliniks threw him out at first. I'm not even sure we stayed that long. Given how long a drive we had back in the van, how hot it was, and how whiny and annoying a dozen sweaty, sunburned kids become when their team is losing by several runs on a late June afternoon, I can only assume that we probably left early. Fortunately we had an hour or more waiting in traffic in the hot van on the way home, not to mention my ten foot arms, to amuse us.